When a series of family crises left her 3-year-old niece in need of a permanent home, April Funches opened her doors. Although the move was in the works for months, the little girl arrived lacking enough clothes and other necessities, which meant Funches’ budget took an immediate hit. And because Funches didn’t have the child’s birth certificate or other documents, she couldn’t make day care arrangements, which for a time put her job at risk. “I didn’t know she was coming with just herself,” said the 33-year-old Chicago home care worker. Over time, the kinks got ironed out, and Funches has never regretted taking her niece in. But she said relative foster parents often don’t get the same kind of assistance that non-relative foster parents get. The number of foster children being placed with relatives in Illinois has been steadily climbing over the last six years, a trend that raises questions about whether those families receive adequate support. Overall, the number of relative foster homes — referred to as kinship care — rose 25 percent from 2012 to 2018, according to the Illinois Department of Children and Family Services (DCFS). The number of non-relative foster homes used by DCFS, meanwhile, dropped 12 percent. It’s a significant shift: In 2012, about 53 percent of youths in foster care lived in homes with non-relatives. Five years later, only 46 percent did, and in mid-2018, it was 44 percent. “Fewer and fewer foster parents are coming forward so it’s not surprising that in Illinois, or in other states, you see this increasing trend of relying more on relative homes,” said Bryan Samuels, executive director of Chapin Hall, an independent policy research center focused on child and family well-being at the University of Chicago. The passage of a new state law is expected to fuel the trend. Under the Fictive Kin Law, passed in 2015, Illinois expanded the definition of family to include individuals unrelated by birth or marriage who have developed close ties to the child or the child’s family. Those individuals include close family friends, godparents, step-relatives, or a relative’s spouse or partner from a civil union. In Illinois, relatives and fictive kin are not required to be licensed — and few of them are. That trend has implications for the amount of financial assistance the families get. In 2012, the state had roughly an equal number of licensed and unlicensed homes where foster children were living with relatives. 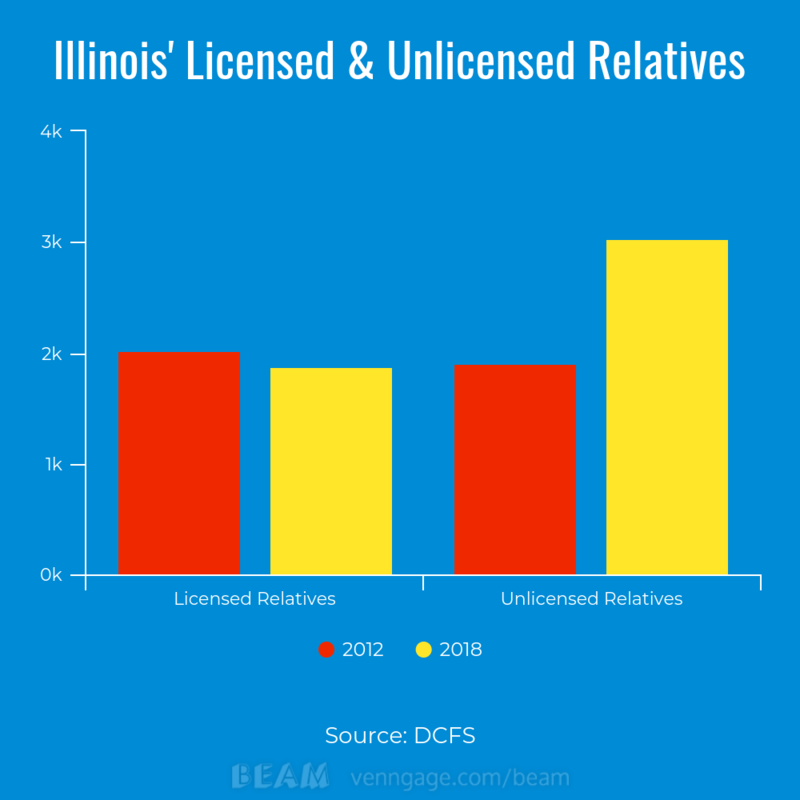 But unlicensed relative homes grew 59 percent by mid-2018, while licensed relative homes declined 7 percent. Under a federal consent decree, DCFS expanded its efforts, particularly in the last year, to identify relatives who can take in children on a temporary or longer basis, Skene said. Relatives can be a more stable, less traumatic option for children being uprooted from their homes following accusations of abuse or neglect. “To us, an important objective for the benefit of the child is to keep them connected with relatives, and often through that, connected to parents,” Skene said. Also, relatives and fictive kin often are available for immediate protective custody without bringing the child into formal foster care, and many are willing to assume guardianship as a permanency placement, according to Skene. Relatives and fictive kin, typically — and increasingly — are unlicensed, and receive lower board payments, which concerns some child welfare advocates. Unlicensed relatives receive a monthly board rate of $286 to $310 for one child, depending on the county they live in. Licensed foster parents receive $418 to $511, based on the age of the child. Unlicensed relatives can qualify for other benefits related to the children. Foster children are eligible for Medicaid. Depending on their income, families might qualify for other government programs such as food stamps and Temporary Assistance for Needy Families (TANF), which provides financial aid to low-income families. But advocates say the lower payments put an additional strain on families and make it difficult for foster children living with unlicensed caregivers to get the same level of care as those living with caretakers who are licensed. Patel said Illinois hasn’t increased the board rate in years. Her office serves as the court-appointed lawyer and guardian ad litem for children impacted by the Illinois child welfare system, about 6,000 foster children, or more than 90 percent of the foster children residing in the state’s most populous county. Some states don’t provide unlicensed relatives with any financial assistance. Federal data obtained by The Chronicle of Social Change found that in 2016, there were 23 states where more than half of the children placed with relatives came without a foster care payment to support a child’s basic care. Jennifer Geiger, an assistant professor at the Jane Addams College of Social Work at the University of Illinois at Chicago, said support for relative caregivers has gotten better in recent years in Illinois and elsewhere, but there’s room for improvement. “I don’t agree that unlicensed relatives should get less financial support,” she said. Some relative and fictive kin caregivers, she said, don’t realize they can apply for licensing, which would make them eligible for a higher subsidy. Skene said many of those caregivers don’t seek licensing because they are stepping forward to help out in a specific situation and don’t plan on taking in other children. There are upsides to placing children with relatives, but also downsides. “The level of safety and the maltreatment of kids in substitute care, who are in kinship foster care and staying with relatives, has been on the rise from 2010 until at least 2015,” said Claire Stewart, staff attorney for the ACLU of Illinois. As part of its 2015-2019 training plan, the agency plans to provide mandatory training for relative caregivers to help them understand their role in helping to prevent child abuse and neglect. Geiger, whose research focus is child welfare and who teaches a course on kinship care, said relative caregivers are put in a more challenging position than non-relatives when it comes to visitation. Does she think placement with relatives is inherently problematic? Some children enter foster care because their parents are struggling with drugs, alcohol or mental illness. When their children are placed with people they know, it can add an extra wrinkle. Reports of maltreatment have recently climbed in all four categories of foster care placements in Illinois — kinship, traditional/non-relatives, group/institutional and specialized homes — according to a 2015 monitoring report by the Children and Family Research Center at University of Illinois at Urbana-Champaign. But maltreatment was most likely to occur in kinship foster homes, the report said. Maltreated youth, regardless of placement setting, were more likely to have significant special needs, mental health issues or substance abuse problems that required “advanced and nuanced care,” according to an analysis of 125 maltreatment reports for fiscal year 2015. Some states are moving to ensure that the quality and safety of placements is even across its network of relatives and non-relatives. California recently passed reforms that require that all caretakers of foster youth be licensed, whether or not they are kin. In Illinois, the ACLU filed a lawsuit against DCFS in 1988 that resulted in an ongoing federal consent decree — now known as B.H. v. Walker — covering a wide range of issues involving the safety, well-being and permanency of youth in substitute care. Stewart of the ACLU said an uptick in maltreatment cases suggests that families need more wraparound services and support, such as therapeutic day care. “We’ve brought this issue to the department’s attention and it has been largely ignored,” she said. In response, Skene said DCFS provides regional administrators with a flexible pool of funds to meet specific needs of families on an individual basis and, in the last two years, has increased wraparound services. McIntyre’s organization supports placing children in loving homes, whether with relatives or non-relatives, but McIntyre said he worries that DCFS is choosing “the cheapest option” for children because of the state’s precarious financial situation. Child welfare is chronically underfunded, he said, and because of political squabbling among state lawmakers, Illinois lacked a budget for two consecutive years until one was finally passed in July 2017. 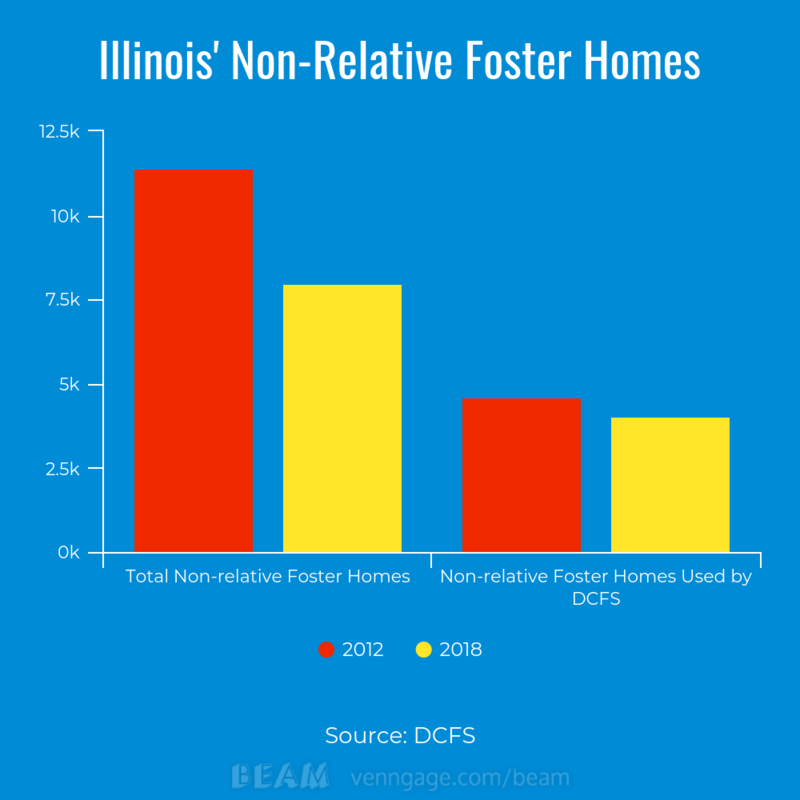 Illinois was responsible for the care of more than 13,000 children living in foster homes in 2012, a number that increased by about 5 percent in 2018. As of September 23, 2018, the number of foster children in all settings totaled 17,139. For Funches, it can be a struggle at times to make ends meet. But it’s worth it because she knows her niece is well cared for. Deborah L. Shelton is a freelance writer based in the Chicago area. For more stories on foster care capacity, visit our new data and reporting project, Who Cares: A National Count of Foster Homes and Families.